Spine Care Delaware is an ambulatory surgery center that focuses exclusively on minimally invasive spinal injections. Our physicians perform over 5,000 X-ray guided spinal procedures per year. The physicians and staff of SpineCare Delaware are vastly experienced in providing care of the highest quality while maximizing patient comfort. We pride ourselves in consistently and collaboratively exceeding the expectations of the spinal medical community. Spine Care Delaware is a Medicare/AAAHC approved facility, and was the first Medicare approved facility for spinal injections in the state of Delaware. 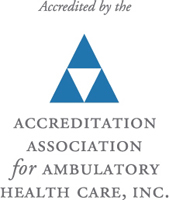 The AAAHC accreditation is a symbol of quality that confirms SpineCare Delaware’s commitment to the highest standards of patient care. SpineCare Delaware has also been recognized by OSHA as a SHARP facility. This puts SpineCare Delaware in an elite group of small businesses that maintain exemplary safety and health management systems. Spinal injections serve as a medical tool to relieve spinal pain, and assist in diagnosing your pain generator. SpineCare Delaware’s physicians perform over 5,000 X-ray guided spinal procedures per year, utilizing state of art medical equipment to insure each patient’s safety and comfort.